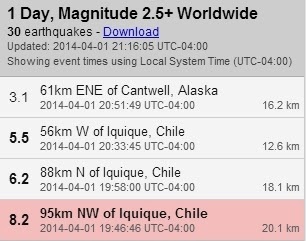 [Update] The northern coast of Chile has been hit with a tsunami following a massive 8.2 magnitude earthquake. According to RT no damages or injuries have been reported as of yet. The USGS has revised it’s initial rating of the Chile 8.0 earthquake and is now showing it at a magnitude 8.2 quake as tsunami warnings go out. The National Data Buoy Center show even the US East Coast in event mode, as seen in the first video below. The warning said Chile, the coasts of Peru, Ecuador, Colombia, Panama, Costa Rica and Nicaragua were at risk of a tsunami. A tsunami of up to 6.3 feet (1.92 meters) could strike the town of Pisagua, Chile, within 44 minutes of the quake. A tsunami warning was in effect for Chile, Peru and Ecuador. A tsunami watch was issued for Colombia, Panama and Costa Rica, according to the Pacific Tsunami Warning Center. The tsunami threat to Hawaii was still being evaluated. The U.S. National Tsunami Warning Center was working to determine the level of danger for Alaska, Washington, Oregon and California, as well as Canada’s British Columbia. “Sea level readings indicate a tsunami was generated. It may have been destructive along coasts near the epicenter and could also be a threat to more distant coasts,” the Pacific Tsunami Warning Center said in its evaluation.